Two skeletons discovered with large stones wedged into their mouths, were buried in this way around 1300 years ago to stop them rising from their graves to haunt the living , a new documentary featuring the work of archaeologists at IT Sligo will suggest. Such “deviant burials” are associated with vampires and also with revenants or ghosts who were believed to come back among the living, unless steps were taken to contain them in their graves. The skeletons, both male, were found side by side in a historic site overlooking Lough Key Co Roscommon, and according to Chris Read, lecturer of Applied Archaeology at IT Sligo, this is the only such discovery of this kind in Ireland . Similar discoveries have been made in Britain and other European countries. 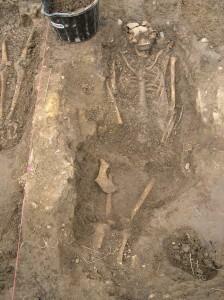 In 2006 the remains of a medieval “vampire” were discovered among the corpses of 16th century plague victims in Venice. The female skull had a rock thrust into the mouth , evidence that female “vampires” were often blamed for spreading the plague through Europe, according to experts. Read, along with his colleague Dr Thomas Finan from St Louis University in the US, excavated 137 skeletons from a site at Kilteasheen, Knockvicar Co Roscommon during a series of digs from 2005 to 2009, in a project funded by the Royal Irish Academy. The archaeologists believe that there were close to 3,000 skeletons on the site spanning the centuries from 700 to 1400. He and a colleague, osteo archaeologist, Dr. Catriona McKenzie carried out detailed tests on the skeletons at IT Sligo this summer. Read stressed that the revenant theory would be impossible to prove absolutely, but said there was no doubt that the skeletons had been subjected to deviant burials which are sometimes associated with demonic possession. Revenants or the “walking dead” often tended to be people who were outsiders in society when living, according to the IT Sligo lecturer .